SHAMUS AWARD (AUS) (Bay 2010-Stud 2014). 2 wins at 1600m, 2040m, A$2,473,500, MVRC WS Cox P., Gr.1. Out of a half-sister to SW Ghozi. Sire of 73 rnrs, 32 wnrs, inc. SP Causeway Girl and of Malahide, Mr Quickie, True Detective, Havana Heat, Rosina Kojonup, Stolen Away, Watchmen, Calzini, Epic Girl, Gennikay, Gumshoe, Irish Songs, Perfect Award, Sausedge, Bronski Beat, Classic Weiwei, Etana, Ginuhit Ng Tadhana, Mookareena, Shamino, Trapio, etc. His oldest progeny are 3YOs. A PINCH OF SALT, by Star Witness. Raced twice. This is her first foal. Battle Hardened. 3 wins at 1200m, 1250m, SAJC Holdfast Insurance H.-twice. PRINCE OF WAR (Royal Academy). 6 wins from 1600m to 2000m, A$215,675, S$162,931, 472,880Dhs in Aust., Singapore and U.A.E, STC Tulloch S., Gr.2, VRC Flemington Racecourse Rose H., Nad al Sheba Green Desert S., Singapore TC Class 1 H.-twice, AJC National Servicemen's 50th Jubilee H., 2d Nad al Sheba Dubai City of Gold S., Gr.3, VRC Four 'n Twenty S., L, Nad al Sheba Al Seef S., AJC Lawn 2YO H., Argos 2YO H., STC Sportless Services Ltd 2YO H., 3d STC Fruit & Vegetables 2YO H., Nad al Sheba Sahm Stud S., STC Wests Illawarra 2YO H., Parramatta Leagues Club 2YO H., 4th Queensland Guineas, Gr.2, AJC Fernhill H., Gr.3, NSW Tatt's RC Ming Dynasty H., Gr.3, Singapore Derby, L.
PERANA (Rock of Gibraltar). 2 wins-1 at 2-at 1600m, 1800m, R419,325, Turffontein Victory Moon S., Gr.2, 2d Turffontein Courier Guy H., Racing Express P., Computaform Express P., 3d Turffontein Ernest & Muriel Preddy Memorial ER Associates S., 4th Kenilworth Cape Guineas, Gr.1. PRINCE ARTHUR (Danehill). 5 wins from 1400m to 2400m, A$307,500, AJC Australia Day Cup, L, STC Frank Underwood Cup, L, AJC Macau Jockey Club Trophy H., Samsung Mobile H., BTC Jacob's Creek Reserve H., 2d AJC Chairman's H., Gr.2, Carbine Club S., L, 3d Hawkesbury Gold Cup, Gr.3, STC Manion Cup, L, NSW Tatt's RC Tattersall's Club Cup, L, STC Lord Mayor's Cup, 4th Murrumbidgee TC Wagga Wagga Cup, L. Sire. Held Hostage (Fastnet Rock). 7 wins from 1550m to 2000m, A$214,680, VRC Secondbite P., SAJC Farmers Union Iced Coffee H., Gordon Ormandy Brian Leahy H., James Boag's Premium H.-twice, 2d SAJC Centaurea S., L, Penang Trophy, L, 4th SAJC Matrice S., L.
Princess Rock. 2 wins at 1400m, 2050m, A$87,757, MVRC Adapt Australia H., 2d VRC Crown Promenade Trophy, MVRC John Paraskevas H., Fisher & Paykel H., 3d MRC Le Pine Funerals H.
TYPHOON TRACY (Red Ransom). Aust. Horse of the Year in 2009-10. Champion Older Female in Australia in 2009-10 (Int.). 11 wins from 1200m to 1600m, A$2,438,600, VRC Myer Classic, Gr.1, STC Coolmore Classic, Gr.1, Queen of the Turf S., Gr.1, MRC Futurity S., Gr.1, CF Orr S., Gr.1-twice, Tristarc S., Gr.2, VRC Schweppervescence Trophy, Gr.3, 2d VRC Myer Classic, Gr.1, Makybe Diva S., Gr.2, MVRC Dato' Tan Chin Nam S., Gr.2, 3d MVRC Australia S., Gr.2, MRC JJ Liston S., Gr.2. Producer. RED ELEMENT (Red Ransom). 5 wins at 1100m, 1200m, A$243,600, VRC AR Creswick S., L, 3d QTC Sir Byrne Hart S., Gr.2. Sire. CANTONESE (Redoute's Choice). 7 wins from 1550m to 2400m, A$314,915, ATC Christmas Cup, L, Ascend Sales Trophies H.
RED BOMBER (Red Ransom). 11 wins from 1200m to 1600m, A$608,510, VRC TAB Rewards S., Gr.3, MRC VOBIS Gold Mile, VOBIS Gold Sprint, Changing Places Real Estate H.
DANASINGA (Danehill). Third on the 1995-96 Australasian 4YO+ Classification (1000m-1400m). 6 wins from 1000m to 1600m, A$1,135,550, QTC Stradbroke H., Gr.1, VATC Schweppes Cup, L, Sandown Park UK S., L, STC Darby Munro S., L, VATC Bond H., MVRC Toy Factory H., 2d AJC Doncaster H., Gr.1, BATC Doomben Cup, Gr.1, QTC Grand Prix S., Gr.2, BATC Courier-Mail Classic S., L, VATC New Gleam H., 3d MVRC Shaftesbury Avenue H., 4th AJC Queen Elizabeth S., Gr.1. Successful sire. TOPASANNAH (Commanche Run). 6 wins from 1600m to 2400m, £14,323, R188,820, Clairwood Woolavington Cup, Gr.2, Newmarket Lonsdale Claiming S., 2d Greyville Drill Hall S., Gr.2, Newmarket Gerald Rosenberg H., Gr.3, Vaal Viljoensdrif H., L, 4th Greyville Racing Digest 1990, Gr.2, Natalia S., Gr.2. Producer. CULLEN (Danehill). 4 wins-1 at 2-to 1200m, NZ$56,000, A$289,250, VATC Blue Diamond Preview (c&g), Gr.3, Rubiton S., Gr.3, 2d ARC Railway H., Gr.1, VRC Chivas Regal S., Gr.3, 3d STC Pago Pago S., Gr.2, VATC Blue Diamond Prelude (c&g), Gr.3. Sire. TOWKAY (Last Tycoon). 3 wins-1 at 2-at 1200m, A$235,500, MVRC CS Hayes S., Gr.3, 2d VATC Schillaci S., Gr.3, VRC Poseidon S., L, MVRC Ian McEwen Trophy, L, 3d VRC Salinger S., Gr.1, VATC Rubiton S., Gr.3. Sire. MASTER OF DESIGN (Redoute's Choice). 7 wins to 1300m, A$938,209, ATC TJ Smith S., Gr.1, Theo Marks H., Gr.2, Alpha Flight Services H., MVRC Eliza Park Sunline Suite Tour H., WATC Perth Racing Silver Members H., 3d MRC Sir Rupert Clarke S., Gr.1, ATC Sebring S., Gr.3, MRC ESP P.H., MVRC Essendon Mazda H. Sire. SUNTAGONAL (Octagonal). 5 wins-3 at 2-to 1400m, R496,400, Greyville Premier's Champion S., Gr.1, Turffontein Protea S., Gr.2, Vaal Winner's World Fasttrack Rating H., 2d Scottsville Gold Medallion S., Gr.1, 3d Vaal Winner's World Fasttrack Rating H., Racing Express Profile H., 4th Turffontein South African Nursery P., Gr.1. TRACES (Snitzel). Winner at 2, R191,750, in 2017-18, Kenilworth Summer Juvenile S., L, 3d Scottsville Godolphin Barb S., Gr.3. ASSAIL (Charge Forward). 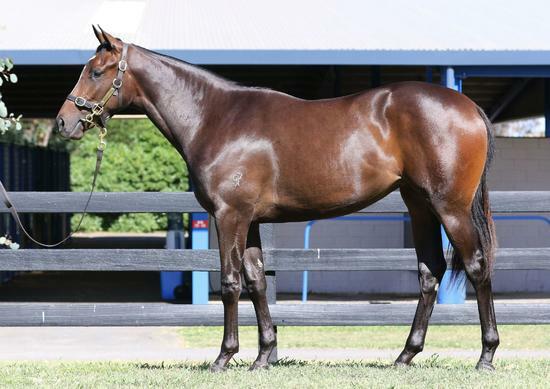 2 wins at 2, A$213,750, Wyong Magic Millions 2YO S., RL, ATC Fonterra Foodservice 2YO H.
HAPPY MORNING (Danehill). 6 wins-1 at 2-to 1500m, A$220,800, M$1,712,050 in Aust. and Macau, SAJC Breeders' S., Gr.2, MVRC Merry Christmas H., Macau Faisalabad H., Dresden H., Macau Classic Trial, 2d VATC Rancher S., 3d VRC Sires' Produce S., Gr.1, 4th MVRC Alister Clark S., Gr.2. AWAKEN (Dream Ahead). 2 wins at 1400m, 1800m, A$104,175, WATC Ascot One Thousand Guineas, L, 3d WATC Lavazza H.
RAFFLES PEGASUS (Fusaichi Pegasus). 4 wins-1 at 2-from 1400m to 1700m in Aust. and Malaysia, VRC Anzac Day S., L, 3d Penang TC Moonee Valley Racing Club Trophy. EN LAUDER (Zabeel). 7 wins from 1400m to 2000m, 412,219Rgt., S$7,773, to 2018 in Malaysia, Selangor TC Piala Emas Sultan Selangor, L, 4th Penang TC Yang di Pertua Negeri Gold Cup, L.